Muddy resident superchef Paul Collins wrote an easy 3 course dinner party menu for summer a few months back, and it had such a great reaction I’ve asked him to do another for Autumn. Most of us are way too busy to trawl through our cookery books, or spend hours perfecting tricky technical culinary flourishes. We want to cook our friends an impressive dinner, for sure, but not to have a nervous breakdown in the process. So you’ll see that much of this dinner party menu is easy to pre-prep, leaving you time to actually enjoy your own party. Give it a go – hell, send in some pictures! – and let us know how you go. Some of my favourite ingredients are about at this time of year – the start of the game season, wild mushrooms, cob nuts, apples & pears and of course my favourite red berries, raspberries. My dinner party for September is designed to impress your friends (of course!) but also make it easy for you to prepare in advance – I’m talking about getting little jobs done days before the event, so that on the day you can spend as little time in the kitchen as possible and enjoy your party. The pastry and the curd can get made weeks in advance. The starter should take you all of 10 minutes to get ready on the day. The partridge legs and the sauce can get made up to 3-4 days in advance, so take advantage of this and get those from the butcher, get him to take off the legs, or give me a shout and I’ll come and do it for you myself! The celeriac puree is another constituent that can get made weeks in advance and frozen. So here we go, 3 courses in no time at all. Enjoy your party! 1. Crack the cobnuts and set aside. 2. Wash the spinach, spin it and lay on a serving plate. Then crumble over all the cheese. 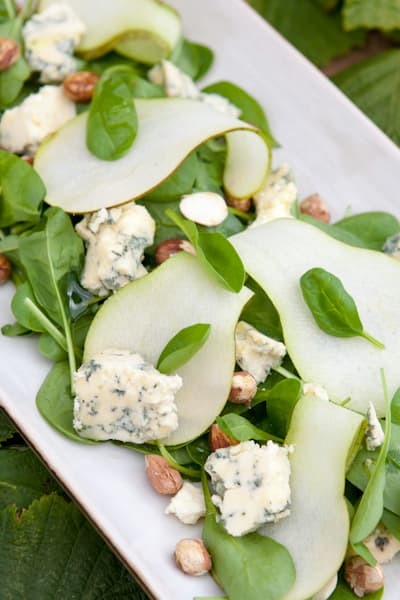 Stichelton works especially well in this salad though Stilton or dolcelatte are good substitutes. 3. 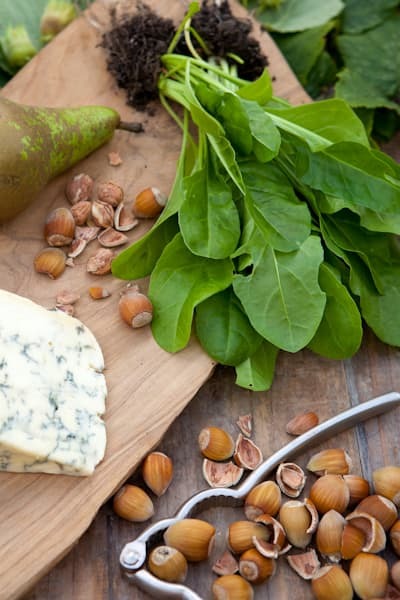 Using a mandoline, or if you don’t have one, an extremely sharp knife, finely slice the pear and arrange over the spinach and the crumbled cheese. 4. Finally, sprinkle over cobnuts and drizzle with a generous glug of your finest extra virgin olive oil. 1. Peel and cut 20 medium sized 1cm squares from the celeriac. Keep and use all of the trimmings to make the puree. 2. Roughly chop up all of the celeriac trimmings and add to a pan with ½ of the butter and a small wine glass of water. Cook gently for 15-20 minutes with a lid on without colouring the celeriac so that the puree remains white. Once the the trimmings are cooked well through, blend in a blender until thoroughly smooth. Retain to one side until required. 3. Slow cook the partridge legs for 45 minutes-1 hour in the chicken stock so that you can remove the thigh bone. 4. Once the legs are cooked remove from the stock, allow them to go cold so that you can twist out the thigh bone easily. Trim the drumstick end of the leg so that the presentation looks its best. 5. Pour the red wine into the stock along with the thyme and any trimmings of shallots (see ingredients) that you may have. Reduce this liquid until it is at sauce consistency, check the seasoning and then put through a very fine sieve to remove any impurities. Keep to one side until required. 6. In a separate pan, roast off the peeled shallots or onions in olive oil and a little salt. Once they’re cooked, drain onto kitchen paper and keep warm. 7. In that same pan you can now cook the cabbage. This is very easy to do from raw, so just finely shred the cabbage and season with salt and pepper and 2-3 tbspn cold water as it goes into the pan, moving it frequently to avoid burning. Be careful no to overcook. It should take about 5-8 minutes to cook in a little olive oil and a knob of butter. Once it’s cooked remove and drain on kitchen paper. 8. Put the pancetta slices on to a non-stick tray and cook at 180C for 4-5 minutes until crispy. Reserve on kitchen paper once out of the oven. 9. In a non-stick pan, seal off the partridges whilst they are on the bone. Place in a preheated oven on 180c for approximately 12 minutes. After 6 minutes or so add the braised legs to the same pan so that they get a little caramalization on them; remove everything from the pan and allow to rest for 10 minutes. Once rested, remove the breasts from the bird with a very sharp knife, trim if required to keep it looking neat. Now you should have all the components sitting on the stove all hot and ready to go! 1. Place the cabbage in a metal ring in the centre of a large hot a main course plate. 3. Add all of the cooked celeriac dice and puree around the outside followed by the hot boiling sauce. 1. Cut up the butter into small cubes and mix into flour and sugar. 2. Add beaten eggs. Mix together, but do not overwork. 3.Wrap in clingfilm and place into the fridge for a couple of hours or even overnight. 1. Roll out the pastry on a lightly-floured surface until thin. 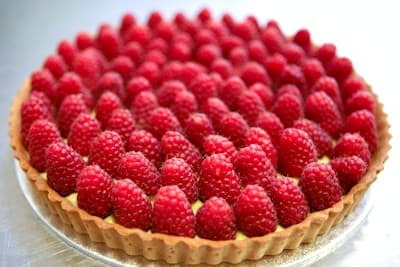 Line a pre lined or non-stick 10” pastry tart with removable bottom with the pastry pushing it into the corners. 2. Line the pastry with a double layer of clingfilm and fill with baking beans. Blind bake for approx 20 minutes in a pre-heated oven on 180c, turning every so often to ensure even cooking all round. Check after 10 minutes, remove the clingfilm and beans in and cook for the remaining time without them. 3. Once the pastry is cooked through remove from the oven and allow to cool. 4. 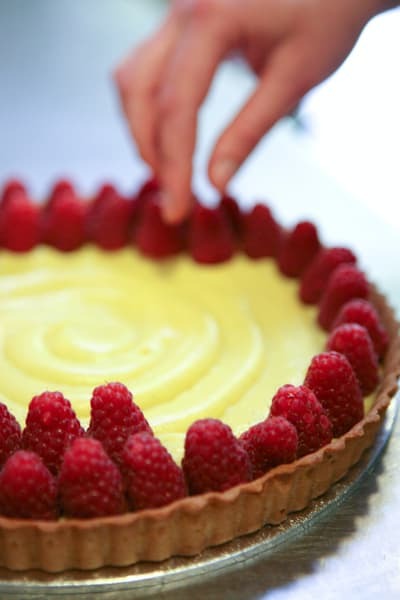 When cooled, place your curd into the base and neatly assemble all of the raspberries around. I like to just serve this up in the middle of the table and allow our friend to marvel in its beauty before the whole thing gets demolished ! Serve with some fresh double cream or clotted if you are feeling a little more naughty. And if you have any raspberries left over you could also whizz the up in your food processor, with a little caster sugar and serve as a raspberry coulis to accompany. 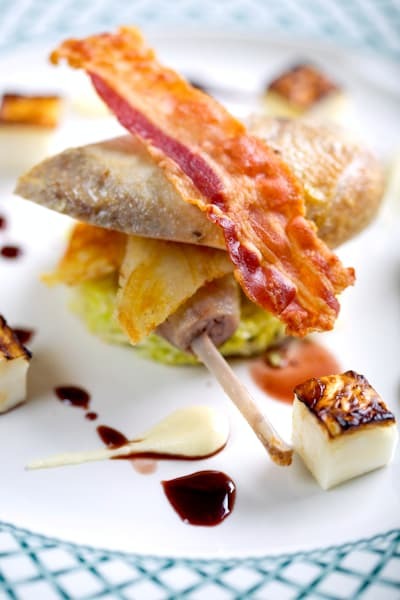 Paul Collins is a bespoke private chef living in Oxfordshire. www.chefpaulcollins.co.uk. Tel: 07774866902/01844 279461. Did all 4 steps, what a great competition, how exciting!! Beautiful prize- all done and looking forward to keeping up with your posts! Wow what a prize!! I did all 4 as requested. Pick me, pick me…….what an exquisite prize.